Are you really eating Rockfish? Chances are you are not, this family of fish (Sebastes genus) has 70 plus species in it. Some fish use their real name, while other fish will have aliases. Most of these fished are named after the color of skin they have, while other Rockfish are named after their physical characteristics. You have rockfish with skin colors of copper, olive, red, green, blue, brown, dusky and many more colors of the rainbow. Rockfish that live deeper in the water will also be much brighter in color. There are rockfish named pygmy, shortbelly, yelloweye, quillback and longspine. 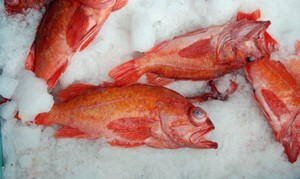 The more notable are the Pacific ocean perch, and then you have the widow, chilipepper, vermillion and canary rockfish. The lean delicate meat of the rockfish has a sweet, nutty flavor with a medium to firm texture. Fillets than have had the fat line removed with have the best flavor. Flesh color of the meat are often either red or brown fleshed. Fillets that are brown fleshed contain more oil in them, while red flesh fillets will have less oil. Rockfish is widely used in Asian cuisine, either deep-fried whole or steamed and served with sauces to accent the mild delicate flavor. Skinless fillets are great for fish and chips, as well as using in soups, chowders and stews. Whole, dressed rockfish, as well as skin-on fillets can be grilled.